NASA’s Mars exploration rover Opportunity captured this southward uphill view after beginning to ascend the northwestern slope of Solander Point, the tallest hill it has encountered in its nearly 10 Earth years on Mars. Guided by mineral mapping from orbit, the rover is exploring outcrops on the northwestern slopes of Solander Point, making its way up the hill much as a field geologist would do. The outcrops are exposed from about 2 meters to about 6 meters above the surrounding plains, on slopes as steep as 15 to 20 degrees. The rover may later drive south and ascend farther up the hill, which peaks at about 40 meters above the plains. Opportunity landed on Mars on January 25, 2004, three weeks after its twin, Spirit. 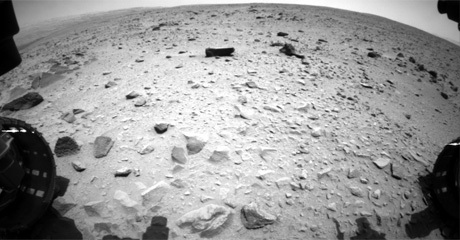 Spirit was the first Martian mountaineer, summiting an 82-meter hill in 2005. Spirit ceased operations in 2010. NASA’s newest Mars rover, Curiosity, landed in 2012 and is currently driving toward a 5-kilometer-high mountain. Recent drives by Opportunity and Curiosity have taken the total distance driven by NASA’s four Mars rovers (including Sojourner in 1997) past 50 kilometers. That includes 38.45 kilometers by Opportunity. For more on Opportunity’s exploration, see the NASA press release.